Now living on the Mexico beach, seeking both inspiration and quiet to remaster the “Here.” tracks for a proper release, plans are now underway for a 6-week tour through the state of California. Keep posted for more information here as I have it. The new release this year, “Darlene“, is a remastered version of 2008’s previous European release, “Here.“, an import that I let go of hastily and was out of my hands before I had time to really work on the masters. ‘Darlene‘, hopefully, contains the kind of tracks and “finished” sound that I expect in a real release, and I’ve managed to complete the first two tracks from those masters; both tracks are available on both SoundCloud and BandCamp, for streaming and for sale, respectively. The goal is to complete the album masters by mid-march, and I am currently working towards being done with these by that timeline. As “Here.” was never truly released to the public officially — save for hand-to-hand sales at shows in Poland and Romania, this will give me the chance to properly distribute this album and focus on the next two or more, resources allowing. Several of the songs, at the same time, have been making the rounds; specifically “Darlene” and “Sin”. 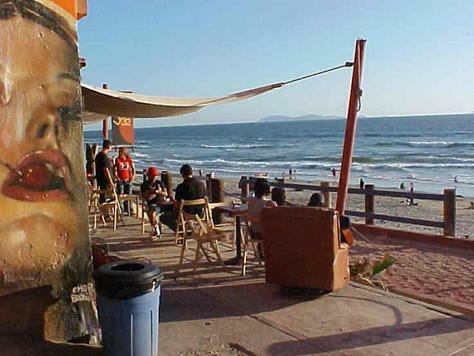 Performing at places like the Latitud 32 above, Julean lives on the beaches of Tijuana while working on the remasters from the "Here." album. My time in Mexico has been a coincidence, and a month later I actually find myself missing the States … (a little bit). As usual, it takes me a little while to fully get my brain around a new currency (just imagine walking into a grocery store and seeing $240 for *anything* … ). I’ve managed a few shows here in this current city but spend most of my time near the beach, being solitary or spending time with new friends, whichever is applicable for the mood I’m in. January found me performing a lot in the cafes along the beach. I never pay for coffee anymore. Meals are ‘on the house’. The people in Mexico are a very giving and very appreciative of music and their makers. This month much of my time is spent these days organizing and mastering the ‘Laura’ album, and now doing research for a California tour. This tour should begin with one (confirmed) show at the House of Blues in March, in downtown San Diego. It’s just a showcase performance, so I thought it might be worthwhile to use the Spring to my advantage. What do you guys think? If there are any California listeners out there, be sure to let me know and I can look into booking shows in your town. Either way, you can track live upcoming Julean and the Rai performances at SongKick; you’ll know the minute that I do. Or maybe a few seconds later.